Even if you’re looking for training on a single social media site, all of the training we provide is tailored to the individual client. We need to understand what you already know, what you’re hoping to achieve, and what your business does, in order to provide you with a course that’s 100% relevant. No thumb-twiddling or window-gazing on our courses – we promise! In addition, we’re quite happy to help you design a half-day, whole day or series of sessions for your organisation which will get every member of staff to where they need to be. 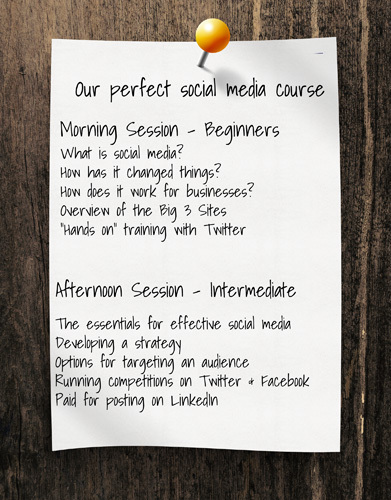 Designing your social media training course around your staff as well as your business needs makes our training SO much more effective. So for example, Facebook training for someone who is perhaps a little skeptical or wary about using social media in their professional life will need a very different approach to providing a course for an enthusiastic current user who just needs to understand how best to use the site for their own business objectives – and the set of skills they need to learn will be different too. So in that instance, some “absolute beginners” training at the start of the day might be followed by a more advanced session later on, where the more confident users can join in. Mixing sessions like this also allows for “hands on” training for those who need it, whilst keeping the more strategic topics for those who already know their way around the social media sites. For small or large group training, we will travel to you in order to minimise costs and wasted time out of the office. We bring a laptop to present from, and will need access to your inhouse WiFi, plus a projector and screen (and of course PCs or laptops for your trainees if “hands on” exercises are to be included). For more information on the benefits of our tailored training approach, click here . Or get in touch and let us know what you do, who needs training and what you’d like them to be able to do; we’ll let you have a quote for the course and we can take it from there!